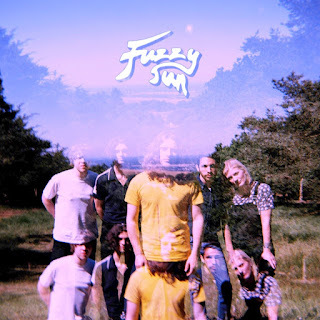 Fuzzy Sun released their second EP Warm Evening / Cold Morning last week via Blossoms' Very Clever Records label. We caught up with Kyle for a chat about the tracks on the EP and their rollercoaster ride of a first year as a band. It's been six months since we last spoke, what's been going on in the world of Fuzzy Sun this summer and what have been the highlights? We have been at a few festivals over summer which have been great, really nice to get on that circuit for the first time! Highlights for us were definitely Kendal Calling, we had a great turn out! Not sure if it was us or the rain that brought them in haha... Either way it was a great show and everyone seemed very responsive! Also we did a show down in Scunthorpe which was amazing! Half the audience had no shirts on and were going mental, so that was another highlight of the summer. And finally recording this new EP, it was great to get back in the studio with the Blossoms lads and put some new tracks down! It's still less than a year since your first gigs, has it gone as you'd expected so far? I would say it has definitely exceeded our expectations as we have had the chance to do so many amazing shows and some unbelievable venues! Also to get these two EPs out that we are really happy with is great too. So its been a wonderful first year so far, but definitely better and more productive that we could have hoped for! We just want to crack on and keep doing more. Your second EP Warm Evening / Cold Morning is out this Friday. Could you tell us about the four tracks on there please? Certainly. The first tune on the EP is Eve, for me it's the poppiest song on there giving you something to have a dance and a sing to. Basically the song is about that initial stage of meeting someone, falling for them, and then being unsure if they feel the same way. If we continue chronologically, I'll be the Man is a song in a similar vein to Eve but is more about longing for a person you can't necessarily be with. This tune takes a little bit of a back seat whilst still giving you some toe tapping grooves and we wanted to highlight the vocal parts in the verses and use the riff as a stand alone melody. Heavy is the lead single off the EP and compared to other songs we have done it is much more guitar driven which has been nice as it gives it a bit of a different feel. The final track is December, similarly to Heavy the song is simply a lament of a broken heart. Funnily enough December wasn't originally going to be on the EP. It was an acoustic song I wrote a while ago and it kind of just got put to one side. But due to a few time constraints we probably wouldn't have got a fourth song fully finished, so we decided to go for an acoustic tune and then slowly build it up and for me it's become a personal favourite and we have had a lot of great feedback from it, so I'm glad it panned out that way really. Eight songs is a pretty impressive output for a band in their first year. Have you got a stash of songs already written and ready to go or do you get them out there when they're ready? We are constantly writing and working on new stuff, so we have tunes ready to go, but the more we write the tighter we get and it allows us to edit so we can put out better tracks. Where did you get the name for the EP? The name came from a lot of tiresome talks, disagreements and compromises. I wanted something that encapsulated the content of all the songs while still having a nice ring to it. As I said before the first two songs are about the beginning of relationships which relates to the idea of a warm evening with someone new (new, exciting feeling etc). And the last two songs are about heartbreaks which refers to a cold morning and a sense of loneliness. The cover is quite striking with the repeated image of the band. Who came up with that idea and why? We did a photoshoot with Charlie Salt (of Blossoms) up in Lyme Park for Propermag so we were just trying a few different cameras and the double exposures came out really nice. So once we saw them we all agreed pretty much straight away that we should use it for the cover. So it was Charlie's idea! You're back out on tour with Blossoms in December. Are you looking forward to playing those shows in some pretty big venues and are they now a bit less daunting now you've had experience of some of them earlier this year? We cant wait it's going to be class! The venues are amazing and it's just such a privilege and a pleasure to be able to play venues like that this early on! I mean I think playing those places is always daunting but we had so much fun doing similar venues earlier in the year we are just really excited to get out on stage again! And what are your plans for 2019. Can we expect to see a Fuzzy Sun album? Fuzzy Sun are on Facebook and Twitter. They go on tour with Blossoms in December at Glasgow O2 Academy (3), Sheffield O2 Academy (4), Nottingham Rock City (5), Birmingham O2 Academy (7), Manchester Victoria Warehouse (8, 9), Southampton O2 Guildhall (11), Bristol O2 Academy (12) and London O2 Brixton Academy (13).